This week Jack White released an album entitled Lazaretto. It is the best of Americana and classic blues, with influences from The Band and Led Zeppelin. The pianos are fresh and the melodies are crisp. Pedal steel guitars, mandolins, harps, harmonicas, and upright bass are just a few of the instruments listed as players on the album. Lyrically, there are themes of too-much drinking and too-much loneliness. Although there are moments of sadness (like in “Entitlement”), the guitar riffs seem to indicate a certain degree of empowerment, like in “That Black Bat Licorice”. “I Think I Found the Culprit” starts off jangley while “Just One Drink” is a boozy classic (“I love you/ But honey why don’t you love me?“). It is easy to imagine any of these songs in an old-time jukebox at a Southern dive bar. Lately, music news outlets are heavily reporting the drama between The Black Keys and Jack White. The truth is unclear and meaningless at this point. It doesn’t matter who did it first. But Jack White just does it better. Lazaretto is sincere and earnest. It is obvious who wins this fight. 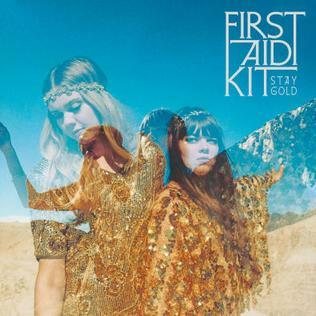 Swedish folk-duo First Aid Kit released an album called Stay Gold this week. Right off the bat, you can tell this is going to be a hopeful album. Records like this are a breath of fresh air in the competitive musical landscape packed with angry and fanciful surrealism. Stay Gold is just lovely and, if you are a fan of silver linings, this will be your album of the week (especially the opening track “My Silver Lining”). In the title track, “Stay Gold,” Johanna and Klara Söderberg sing for simplicity. Even when heartbreak is followed by despair, there is an opportunity to look on the bright side. It is a very nice sentiment. “A Long Time Ago” deals with not measuring up but deciding to let it go. Realizing that you cannot be everything to everyone may be the key to happiness, according to these songs. “Shattered & Hallow” is one the most striking tracks on the album. Johanna and Klara Söderberg sing: “I’d rather be broken than empty / I’d rather be striving than settled / I”d rather be moving than static/ I’d rather be by your side.” Taking risks is better than being scared of the consequences. One should note that FAK toured with Conor Oberst and sang on his most recent album. In this song, Oberst’s influence is felt most strongly. The great thing about First Aid Kit is their sincerity. Sometimes themes of hope and love seem forced. But with this band the listener can trust the words. It is the harmonic give-and-take between the sisters. They seem weightless in a world full of troubles and pain. Its almost like they rise above. And that is very refreshing. Remember the band Say Anything? They released a new album called Hebrews this week. After some research, I read that frontman Max Bemis married Sherri Dupri (Eisley) and moved to Texas. He has also released a number of albums in the last 10 years and teamed up with Chris Conley (Saves the Day) for a project called Two Tongues. With Hebrews, it is obvious that Say Anything (Max Bemis & others) is committed to constructing bitter and caustic songs. Along with powerhouse emo veterans like Tom Delonge (Blink-182, et al), Chris Conley (Saves the Day), Matt Pryor (Get Up Kids, New Amsterdams, etc), and Sherri Dupree, songs like “Six Six Six,” “John McClane” and “A Look” attempt to recapture the glory of 2004’s …is a real boy. In the title track, “Hebrews,” Bemis expresses discomfort with religion and throws around a bunch of Hebrew/Yiddish words like schlemiel and shlemazel. The song ends with “Please to meet you / I’m the Hebrew.” Finding one’s true love has never sounded so aggressive than in “The Shape of Love to Come.” It may be Bemis’ vocal style but its like he feels militantly happy about finding his true love. In “Losing My Touch” he directly addresses growing older, struggling with songwriting, and performance woes. Love it or hate it, Say Anything tells it how it is (or at least how Bemis perceives it to be). His style may be polarizing and after all this time, one really does wonder what he is still so angry about. It is interesting and uncomfortable at times. But it is Bemis for sure and no one can blame him for being so expressive about his internal puzzles.